Hello everyone, the weekend is almost here and here's hoping that you have some time for crafting as Daniele has a fabulous theme for you this week. 1st place - Laine who wins a £5 voucher to spend on the website, 2nd place - a tie between Suzi and Wendy - Congratulations! please email Nikky for your prize and blinkies - the first placed winner receives a free download! Please put in the subject field of your email your placing and the challenge number. Now for this week's challenge and we'd like to see your creations with a Shabby Chic/Vintage style - read on for the Design Team inspiration as I think you'll agree that they've totally rocked this challenge! The winner of this challenge will receive a Pretty Sweet CD which is such a great prize! Ruth: I've gone for the two-for-one approach again! But how can you make just one baby card - you need to make two! The embossing is a Marianne folder along with the cute Baby Carriage (LR0218). 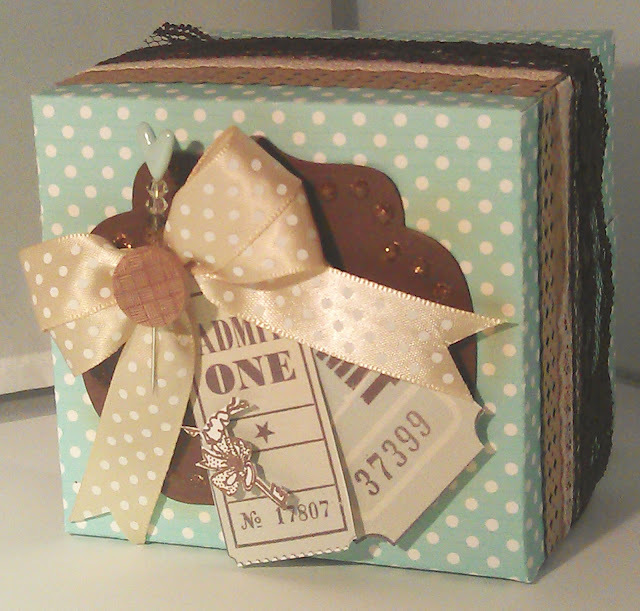 I've used papers from Sugarplum Daisy (gingham) and Candy Doodles (plain) along with ribbons and charms from my stash. Daniele......I have used the shabby flower from The Candy Doodles Cd and tore around the edges,the background paper is also from the same Cd. I then distressed the edges of the flower and crumpled them up, afterwards I spritzed the flower with glimmer mist and added the pearl embellishment to the centre. 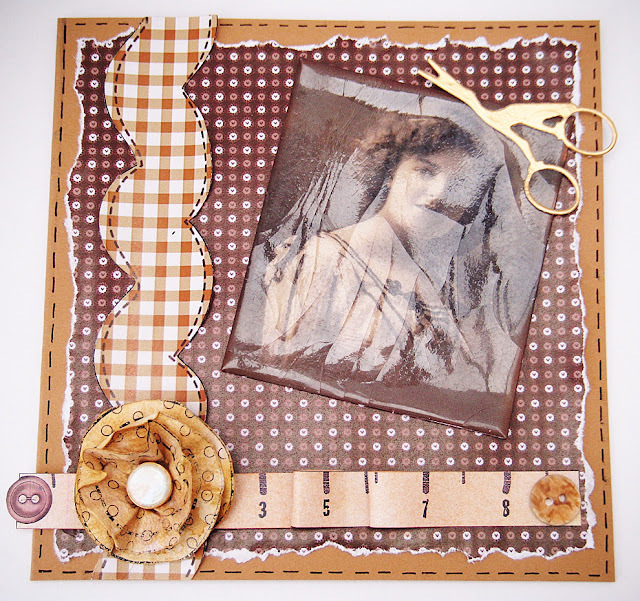 Lucy: For this theme I used papers and image from the Sugarplum Daisy CD Rom. 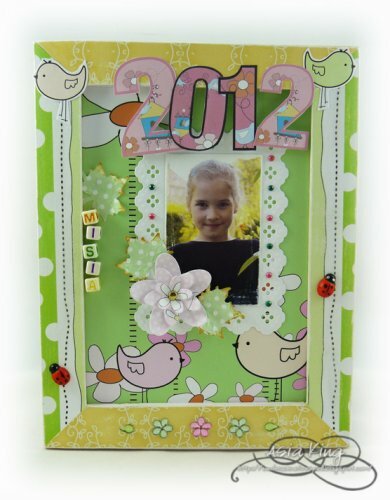 The frame, flower and flourish are made using Marianne Design Creatables. I distressed the edges of the papers to give a vintage look using Distress Inks. The image was coloured using a mixture of Pro Markers and FlexMarkers. Emma - Hello there, I thought as this is my very favourite design style, I would get crafting for this weeks challenge too. I chose the very gorgeous Sugar Plum Daisy CDROM to gather the elements for my creation. Simple, shabby and splendid! Doreen: I used for my card my new rose basket from Marianne Design Creatables .The paper is from the fabulous Pretty Sweet CD. Fliss: I've made something totally different for this challenge - a shabby chic canvas using the gorgeous teacup from the Sugarplum Daisy CD with elements and papers from rather a lot of CDs so you'll need to hop over to my place to see and prepare to be amazed at how well they all go together. I printed out on to canvas and did ripping and inking for the shabby look along with wonky stitching. The little flowers are muslin cut out with a Marianne die. Anne: For my card I printed the papers from the Not for Girls CD and distressed them to within an inch of their lives by scratching and inking the edges. I then cut the flowers using two of Marianne's dies and gave them the same treatment plus a good dose of glimmer mist. The image is from our new CD Sugarplum Daisy and I've coloured it up with copics and a little glitter on her wings. 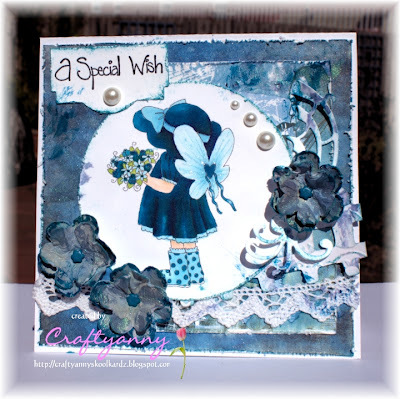 The sentiment is from the Fairy Flutterfly Bevvieboo stamp. Once I'd put the card together I carefully 'spilled' some water colour paint on it and also gave it a good dollop of acrylic in places too. Claire: Surrounded by new babies at the moment, an excellent opportunity to use the wonderful baby boy from Sundae of Seasons, alongside the lovely papers and Marianne Design dies, finished with a sentiment ticket from Candy Doodles collectors edition. Lisa: 'The Crafting Owl'. This week I've made a card using papers and embellies from the Sundae of Seasons CD-ROM. The flower I printed from the Candy Doodles onto cartridge paper which I inked and scrunched. The scissors are a Marianne Die as is the Vintage image. Ashley Lydia: I made a vintage box and card to match. I've used the Sunday of Seasons blue dot paper, Alice In Wonderland key, and Pretty Tuff for the tickets. Miria: For my card I used paper and sentiment from lovely Pretty Sweet CD, the stamp, the decoupaged image and the die cut are from Marianne design . I coloured the image with Distress, then added Glossy accents and cracked it. Pearls, lace and buttons from stash. 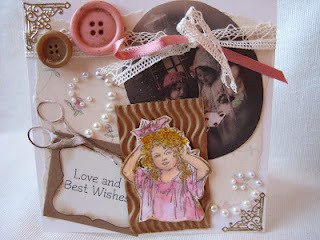 Lana: I have really enjoyed this challenge because I adore anything vintage/shabby Chic and girly. 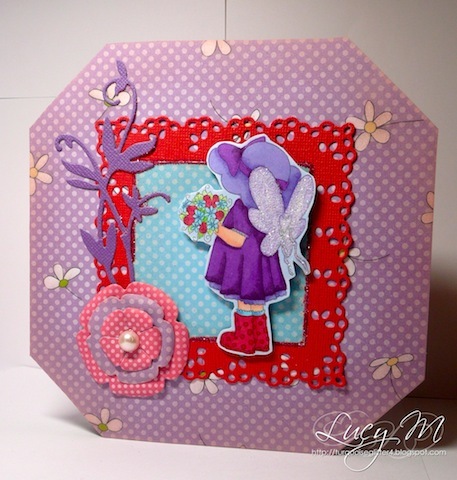 For my card I have used the new and fabulous Sugarplum Daisy CD. So there's your inspiration - some fantastic projects from the DT this week I think you'll agree! You have until Sun 6th May at 12 noon GMT to enter the challenge, so just add your URL to the Linky below! Good Luck! Hello everyone, NJ here. I hope you can all feel the buzz of excitement in the air with the pre-order of the Pen & Paper Circle Issue 3 now available. Issue 2 has just been sent out and if you are one of the lucky recipients who got your orders in I am sure you are all loving the fabulous tutorials from some of the design team. Don't forget too that Nikky is on our screens on the 24th & 25th on Create & Craft. Check out the Polkadoodles Website for a fabulous selection of crafty goodies including Marianne Design Dies so many lovely ones to choose from. 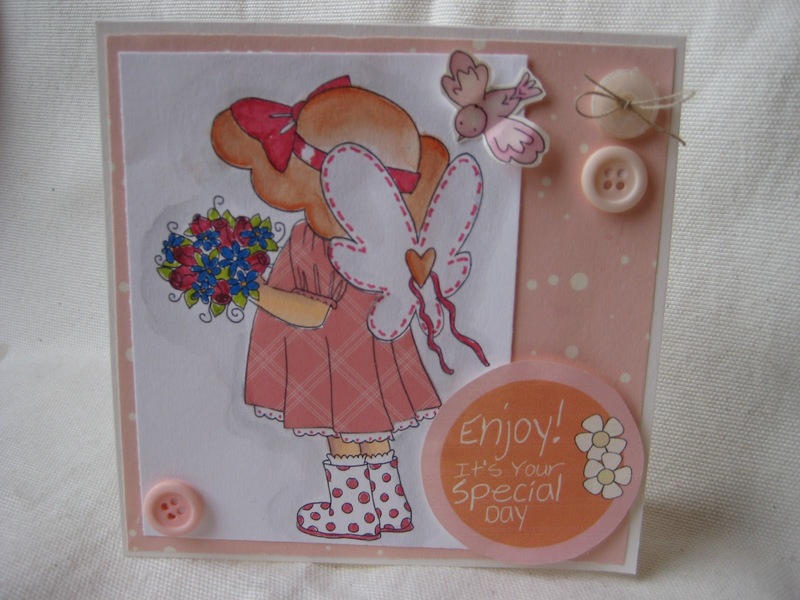 Marianne Design have a wide selection of crafting goodies including dies, papers and stamps too. Also look at the fabulous selection of Polkadoodles CD'S and other products, there's always something new every week! Congratulations! please email Nikky for your prizes and blinkies! Please put in the subject field of your email your placing and the challenge number. Onto this weeks challenge which has been set by Enfys. As it is nearly St. George's Day we would like to see a red & white colour theme. Here's what the design team have made, this time they were allowed to use a stamp from their stash... the winner of this Challenge will receive a copy of our fabulous Sundae of Seasons CD. Emma Hello there, I have used a favourite stamp with some Marianne Design Creatable die cuts along with some of the gorgeous stamps that were in the first issue of Polkadoodles Pen and Paper Circle. I made my own backing paper with the stamps, coloured everything with Distress Inks and then finished the flower with a fancy brad. Nelly Welcome to another Polka doodle challenge :) for this weeks card I have used Fairy Flutterfly rubber stamps set "Maggie" and coloured her with promarkers. 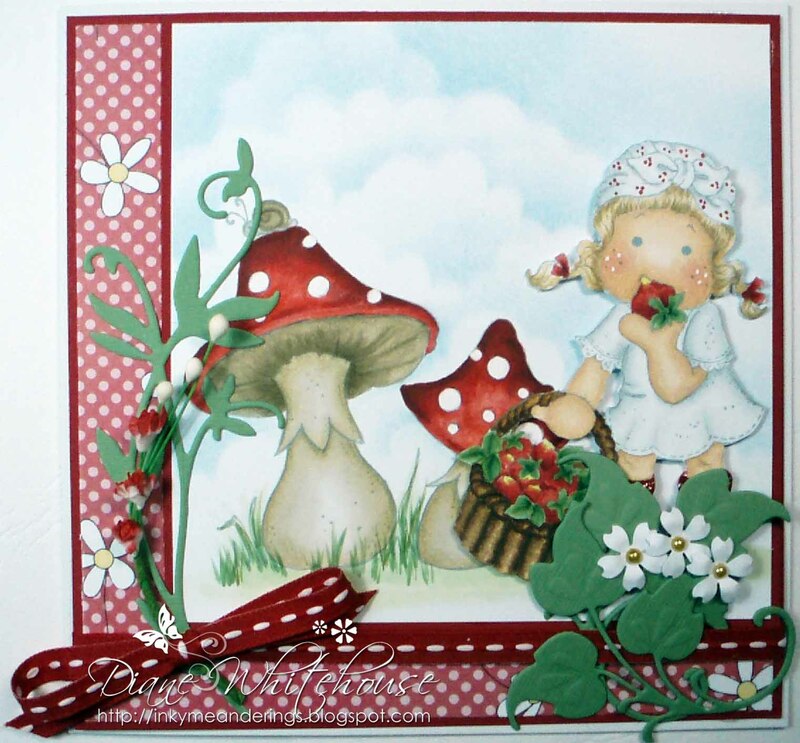 The red and white polka dot design paper is taken from Sundae of seasons cd and the toadstools that 'Maggie' is relaxing on came from the new Sugar Plum Daisy CD, the flower and butterfly edging trim is a stamp set by Marianne Design. NJ Hello everyone, for my red & white theme and stashbox stamp I've used the Polkadoodles Dragonfly Neighbours Clear Stamp along with the Sundae of Seasons CD. The sentiment is from the Paper Boutique Volume 3 CD and the decorative paper the image is matted onto is from Marianne Design. I coloured the image with Polychromo pencils. Lou: I have decided to make a dreaded "male" card for this weeks challenge using papers from the Pretty Tuff CD (although I have sneeked a little blue in there too .... lol ). The sentiment stamp was a freebie on a craft magazine which makes a great sign. The arrow is hand cut and so are the traffic lights which has been finshed off with buttons (coloured with Promarkers). A really quick and simple card. Shell-I loved making this card, I used 4 cd's for this one. The papers are from Pretty Tuff, the tickets and sentiments are from Sugarplum Daisy and the image is of course off Pretty Sweet and lastly the fabulous flowers are from the Sundae of Seasons...the image was coloured with a mix of copics and pro markers. Claire - My worst nightmare - Red and White and a Stashbox Stamp LOL. So I went for a Christmas card this week. I used the some of the elements from the fantastic Pond Neighbours Clear Stamp Set to create a mini scene in the aperture of my card before giving it a sprinkle of texture paste, Glossy Accents and glitter. The snowflake die is from Marianne Design (LR0125). Dee - I have used papers and image from the Sugarplum Daisy Cd. I've also used Polka Doodles sentiment stamps and bird stamp which I stamped on the main image sheet, and then on the polka dot paper, cut out and fixed over the first one with 1mm foam pads. Norine - I loved this red and white challenge and I kind of got a bit carried away and ended up with two cards!! I didn't actually use any stamps from my stash because I didn't feel like any of my own went with the challenge well enough. The first card uses an image from the SugarPlum Daisy cd and paper from the Magical Winter 1 cd. 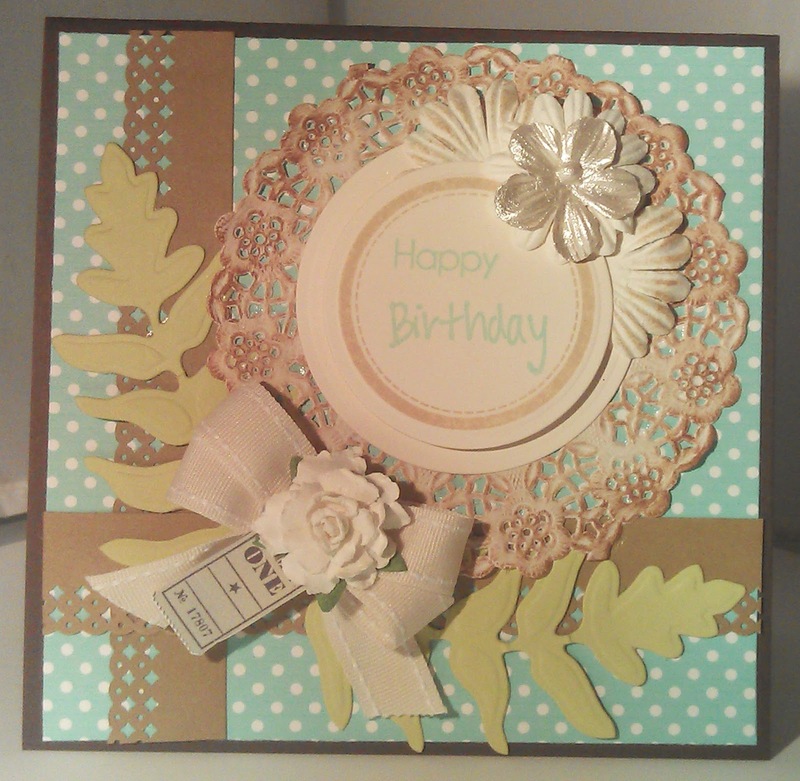 The addition of some velvet ribbon, gems and a paper doily complete this pretty any occasion card! The second card uses images from the Sundae of Seasons cd paired with matching PolkaDoodles paper. I used a Spellbinders die and an embossing folder to create the background and then layered the printed and hand cut images on top. Shary - Here's my red and white card for this week's theme. Although it's a feminine card I've used the papers from the Pretty Tuff CD, even the punched flowers are from the same paper. I've added a little gem to the middles. The bird cage is a die by Marianne Designs which I die cut and then distressed a little and added a bow. The sentiment is from Candy Doodles which I cut out and inked around the edges. I've paper pieced the girl with the same Pretty Tuff papers. Joanna: For this card I used all my favourites ;). The super delicious papers are from Sundae of Seasons and Love & Cherish CDs. The sweet image is from the Pretty Sweet CD and I coloured it with Inktense pencils. The magical sentiment is from our newest release - Sugarplum Daisy. To embellish the card I created some dimensional flowers from the same papers using Marianne's Design CR1202 die and the gorgeous leaf is Marianne's LR0150 die. The flowers centres were also decorated with a touch of Liquid Pearls. Diane For our Red and White Challenge to celebrate St. George’s Day, strawberries and toadstools seemed like good subjects to use – not often featured together but I hope you like it! The paper from the Sugarplum Daisy CD was perfect for the strawberry theme and the red and white. So there is our inspiration for this challenge - you have until Sunday 29th April to enter! Entries close at noon GMT - good luck! Hi everyone - have you all got over the Easter break yet or are we still guzzling lots of chocolate and candy??!!! Before we get onto this week's challenge let's find out the winners from week 13 which was the Easter challenge and hop! We had a lot going on that week and judging by the entrants and comments everyone enjoyed themselves although lots of you didn't leave your answers in the comments! First place - Michaela with an awesome entry! 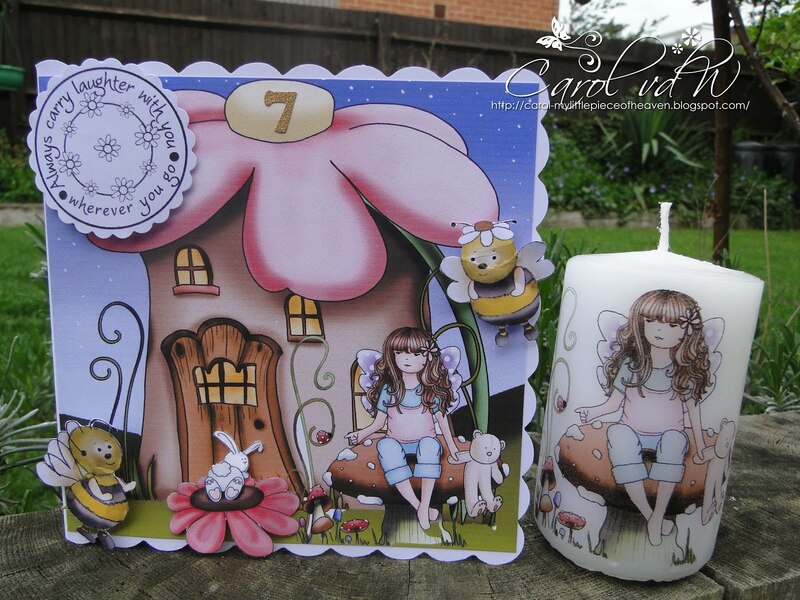 Well done Michaela, you win our Marianne Design candy and the Sugarplum and Candy Doodles CD's! Phew!! And just in case you were wondering, the unscrambled letters spelt SUGARPLUM DAISY. For the Design Team members who had additional candy to give away on their blogs, please visit their blogs to see if you were lucky! Right! Onto this weeks challenge! 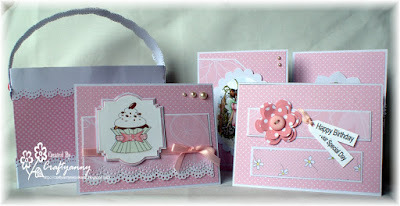 The theme is Pretty In Pink and the challenge is open until Sunday 22 April at 12noon GMT. The winner of this challenge will receive a £5 voucher to spend on the Polkadoodles website - woohoooo! Ruth: This must be one of my most favourite templates to use as I turn to it time and time again - really quick and easy to make (and it comes in mint green too!) It's from Paper Boutique Vol 3 and I've layered everything up with foam pads. Added glitter, some ribbon from my stash and the chocolate stars are covered in glossy accents! 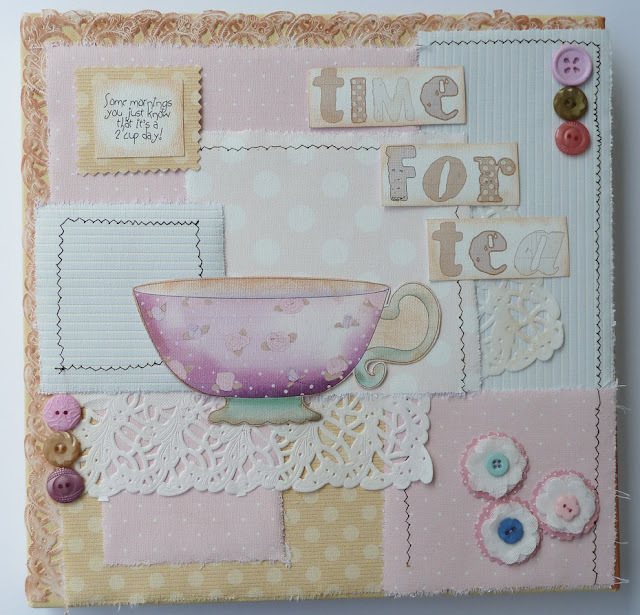 Josie: This week I used the lush backing papers and toppers from the Candy Doodles CD Rom. I added glitter around the edge of the card and finished with a Marianne Die and some flowers. 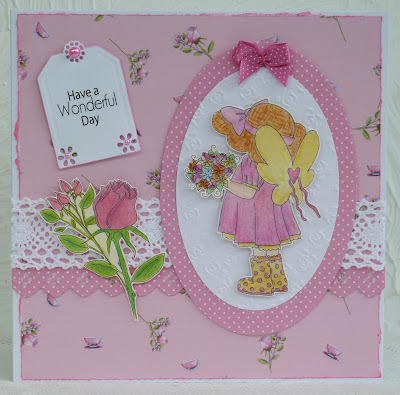 Doreen: For my card this week I've used a beautiful image and papers from the Sugarplum Daisy CD. The image has been coloured with Copics. Fliss: For my card this week all elements come from the new Sugarplum Daisy CD as I love all the very pretty and girly elements on there. I printed the sweet image and a rose onto watercolour paper and coloured them with a mix of watercolour pencils and Prisma pencils, adding a touch of glitter. I tore the edges of the backing paper and inked for a shabby chic look. 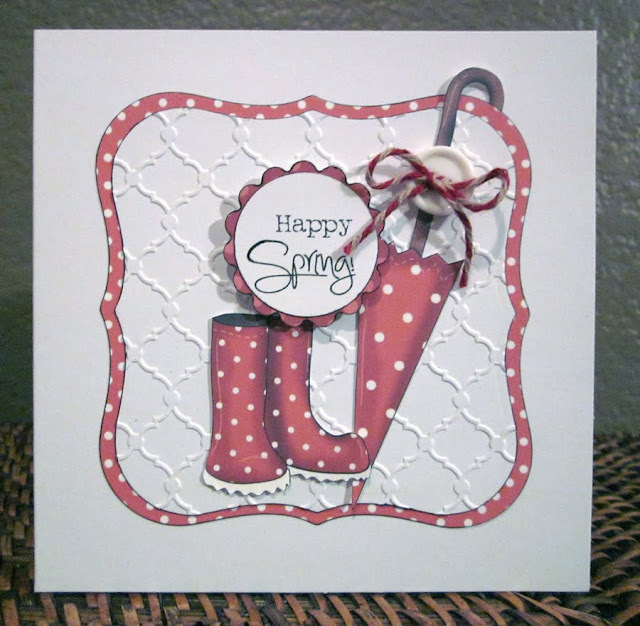 I used a Marianne Design lace die and pretty tag die to cut out the sentiment. Lou: I have jumped aboard this week as I could not play along last week. I have used papers from Candy Doodles Collectors Edition as is the sentiment from the same CD. The roses are part of the stamp set from from the 1st issue of the Pen and paper Circle Club as is the delish strawberry backing paper. I have used the following Marianne Design dies on my card; decorative panel and butterfly plus the gorgeous pom pom lace/ribbon is also from Marianne Design too. The card has been finished with some organza ribbon and heart gems. Enfys: I couldn't resist this little angel from the Sugarplum CD, I printed her out twice, once onto white cardstock which I cut out, then again onto pink spotted paper from the CD, and cut out just her dress and wellies and paper pieced those onto the image that I coloured with Promarkers. The background was printed from the same CD, but I added some punched flowers to the fence and grass. Daniele......just loving the new CD Sugar Plum Daisy so I've gone overboard with the pink for this challenge, I've used a pre printed topper and also a digi image which I coloured in with promarkers and flex markers. The grass was created using a Marianne Design die then I added sequin flowers. Anne - I've used two CD's and Pen and Paper Kit 1 for this project. Candy Doodles and our newest release Sugar Plum Daisy. 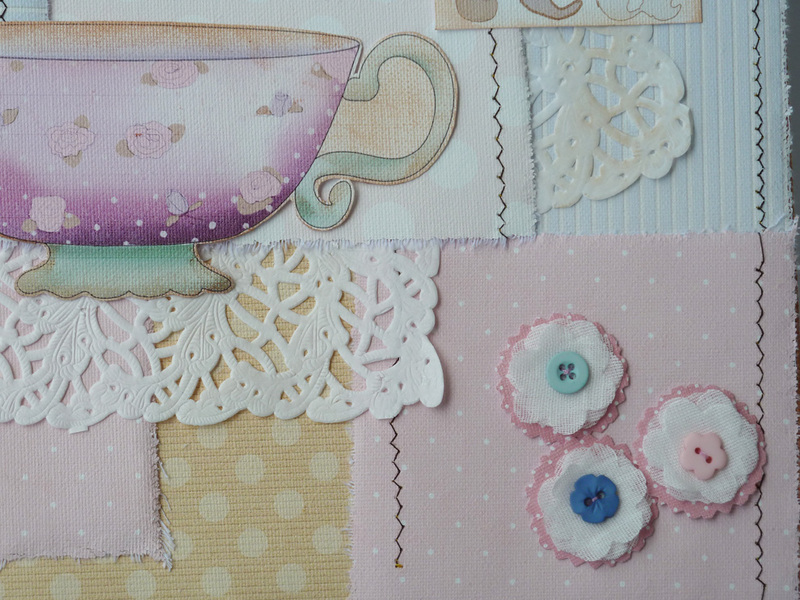 A Marianne Design flower die and some ribbon and pearls from my stash. Lisa - 'The Crafting Owl'. For my project I decided to do a page in my journal as I think that the images from the CD-ROMS are just perfect for this. I used the owl from 'Back to Nature', papers torn and stuck on the page from Sugar Plum Daisy and Sundae of Seasons. The stamps are the 'Be Neighbours' set. I then added abit of doodling to bring the whole thing together. More pics and journaling on my blog. Miria For my card I used a lovely image and papers from cd Sugarplum Daisy. I coloured the digi with kuretake zig art and twin.and paperpieced her dress. The sentiment is from cd Candy Doddles Collectors' edition. Patty I used papers from Sundae of Seasons and Pen & Paper Circle Magazine and the Girl from Pretty Sweet.I love the position of this girl that's why I wanted to make a birthday card for a Girl that used to sit just like that, and add the white border to the edge to make a combination to the pink and brown polkadots. Claire So Pretty in pink is this lovely girl coloured with Promarkers from the Pretty Sweet cd which has combined with the yummy layered heart cake from Paper Boutique Vol 1. Just added a few sticky gems and some stickles. Good luck with the challenge and please remember our rules when entering! The challenge is open until Sunday 22 April at 12noon GMT and add your creation to the widget below! Hello NJ here, I just wanted to say Happy Easter to you all and welcome to another fab challenge this week. Have you all entered last week's fab Blog Hop?? We have more candy than you can poke a candy cane at and you still have until noon on Easter Sunday to enter so make sure you get hopping NOW! Those of you who watch Create & Craft TV, you can also catch Nikky doing the Paper Clinic 2 hour slot on Easter Monday at 11am - lots of colouring, hints and tips and answering questions, so if you have bank holiday boredom tune in! 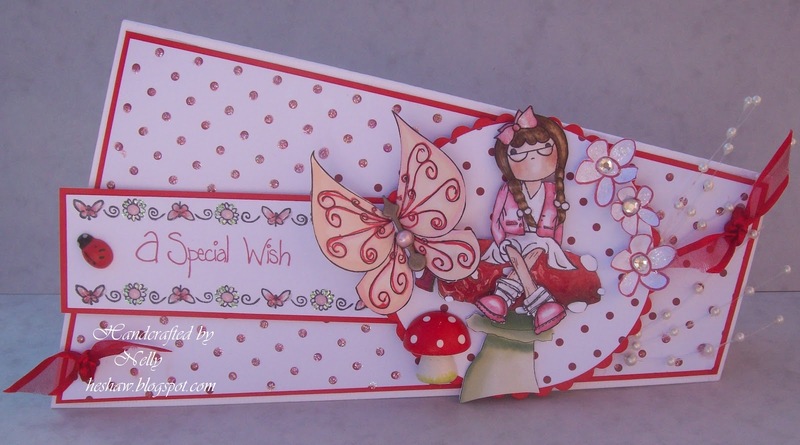 Don't forget to check out the Polkadoodles Website where you can find fabulous dies and stamps from Marianne Design and also lots of other gorgeous crafty goodies, don't forget to check out the Polkadoodles CD ROMS while your there. Who needs an Easter Egg! 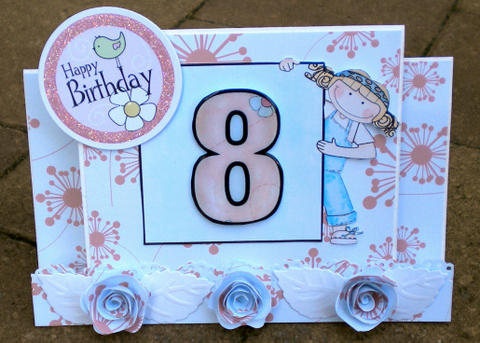 Ruth: I've used a firm favourite with the Sugary Cake template from Paper Boutique Vol 1. I've used a Marianne Design Creatable embossing die on the card blank and also on the larger cake layers. Although you can't see it, the cake icing is rather sparkly as too are the numbers which I've attached with curled wire. Emma Hello there, I have combined some of Polkadoodles gorgeous Pretty Sweet papers with beautiful Marianne Design Creatables die for this 21st bithday card. For the folded flower, I used a scalloped shaped ribbon style trim from the Sundae Of Seasons Cd. 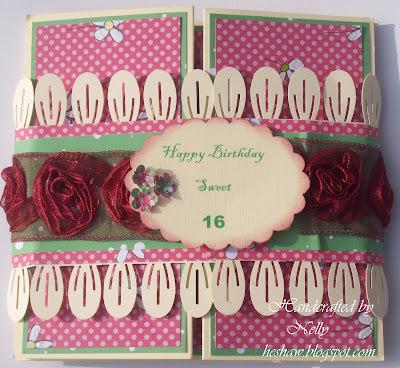 Nelly - Hi Everyone for this weeks Big number Birthday card I have used images and design papers from the new Sugar Plum Daisy CD , the style is a Z gate fold and I have made the wrap to hold it closed, perfect for a sweet 16th Birthday :) embellishments are also from this adorable Cd! Shell- For my card this week I've used a beautiful image and papers from the Sugarplum Daisy CD. The image has been coloured with pro markers. I made the rolled flowers using a Marianne Design Die LR0163, the ribbon, pearls and metal corner are from my stash. NJ Hello for my big number I have made a card using the All Around & Everywhere CD I have hidden the '50' on a tag and popped it in a pocket. I used a Marianne Design Creatable LR0118. Claire (Happy Days) - I've used the Sugarplum Daisy and Paper Boutique Volume 1 CD to create my handbag card. I've also used the alphabet and number set from the new Pen & Paper Circle Magazine 2 to create the sentiment tag. The gorgeous butterfly clasp is from the Marianne Design butterfly set LR0158. Clare:- I've used papers, image, number and sentiment from the new Polka Doodles "Candy Doodles Collectors Edition" CD-Rom. I've coloured the image and number with alcohol markers and added glitter, clear ultra thick embossing powder and glossy accents as highlights. 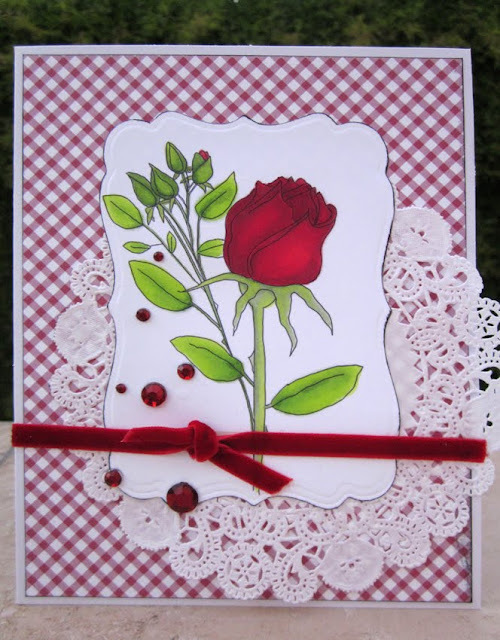 The roses and leaves are from the Marianne Design die "English Rose" LR0162. Joanna: As I didn't have any "big" birthdays coming up, I decided to incorporate the BIG numbers into these cute frames for my 2 adorable nieces as a keepsake of what they look like in 2012 :-). The papers are a mixture of Sugarplum Daisy, Candy Doodles and Sundae of Seasons and the numbers are from the Sugar Birdies CD. 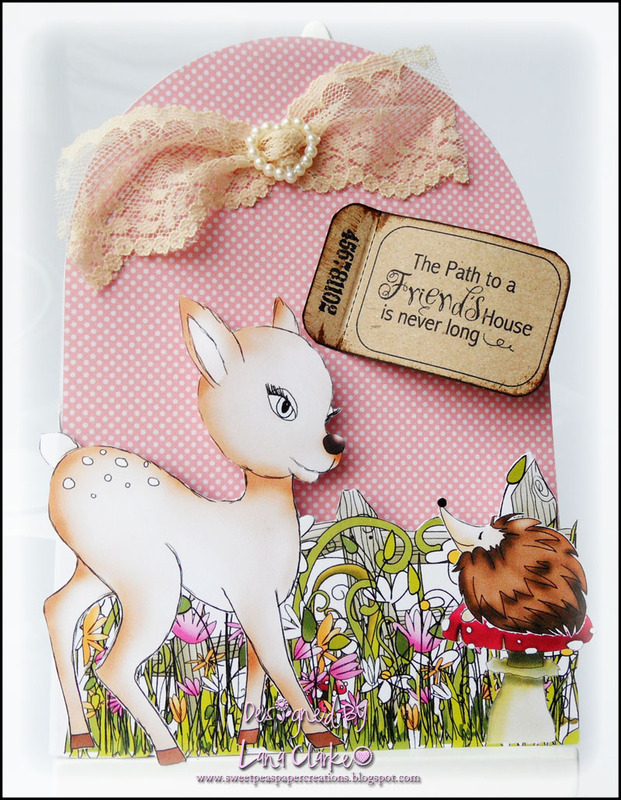 The gorgeous die cuts are from Marianne Design CR1202 and LR 0141. 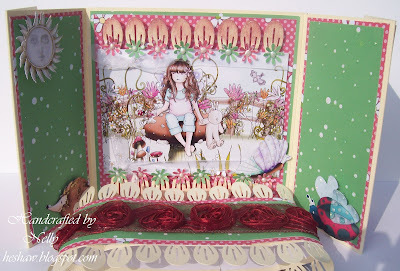 Dee: I have used the tree and birdhouse image, backing papers, ticket, numbers and a flower from the Candy Doodles Collectors edition CD, and the girl and the toadstool are from Sugarplum Daisy CD for this weeks card. The fence, birdhouse, bird, fence and swirl are Marianne Design Dies cut from a very pretty Marianne Designs backing paper. Some inking with distress inks and faux stitching finishes off the card just nicely. Shary- For my card I've used the Not for girls Polkadoodles CD for the papers, letters, number and sentiment and the cute image is called Skating Don by Marianne Design. I've coloured him in with Copics. Diane - My card for a lucky 40 year old uses the Fairy Flutterfly Gracie stamp and pretty paper from the new Sugar Plum Daisy CD. The numbers were also from the CD but the sentiment and flowers are part of the stamp plate, I just drew the stems and leaves for the flowers. 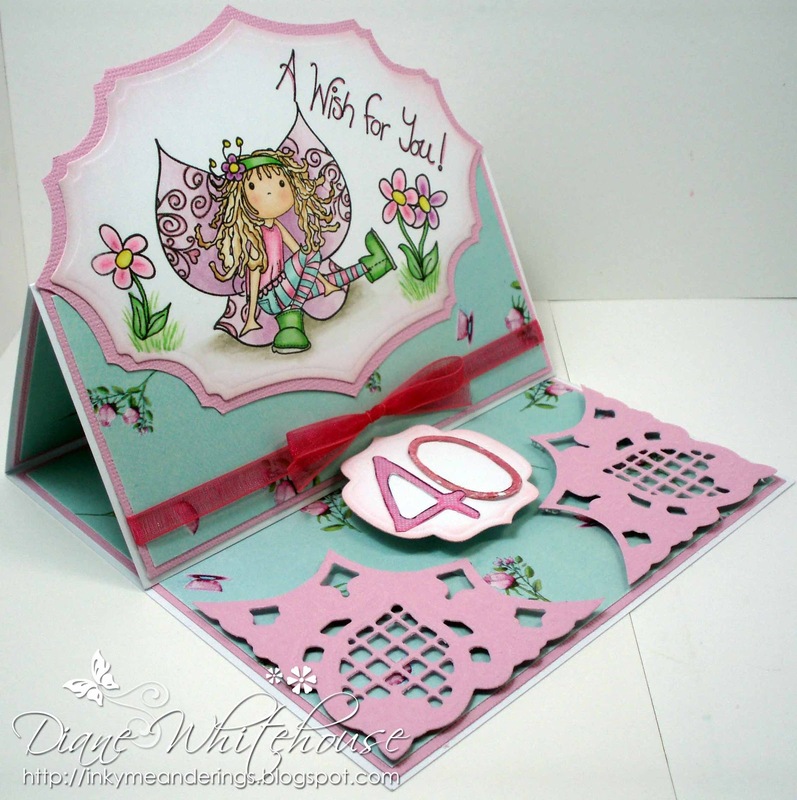 The lovely corners are from a Marianne Design die and everything is coloured with Copics. Carol - For my card I have used the brand new gorgeous cd called Sugarplum Daisy. I've played around in my graphics programme and merged a couple of images as well as printed out the little bees and bunny on the flower and popped them up on some glue gel for added dimension. The sentiment is also from the cd. I then printed the little girl onto some tissue paper and adhered it to the candle. Lou: I didn't want to go all "guns blazing" announcing the significant birthday, (not saying that this is Ruth's "0" birthday) but instead have created lickle dots with a number on! All papers are from the new Candy Doodles Collectors Edition as they are such a fab selection of papers and so versatile; as is the cupcake and sentiment (printed on to Safmat). The embossed panel at the back is a Marianne Design "Designables die which both cuts and embosses. 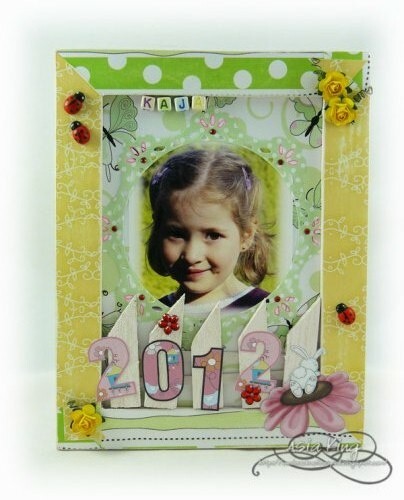 I have also used a Marianne Design frame and butterfly die. So there is our inspiration for this challenge - you have until Sunday 15th April to enter and be in with a chance of winning that fabulous candy! Entries close at noon GMT.